We will be looking at the different high speed counter modes available in the click. This is all setup through a user friendly graphical user interface. Let’s get started! 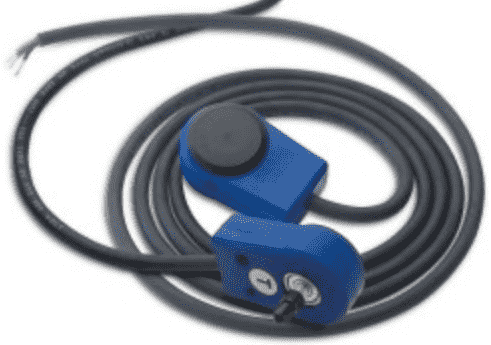 The Dart PU Series pick-up is an economical and reliable way to monitor motor speed. Its unique design provides ease of installation in otherwise difficult to reach areas. 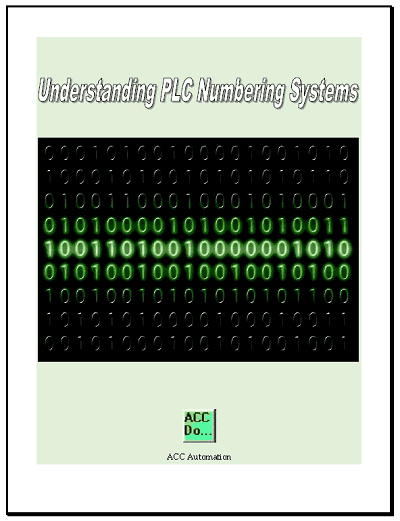 The PU pick-up operates at a 5 to 24 volt level producing a sharp square wave output, which may be fed into Dart’s field programmable tachometer, closed-loop control, counter, or any other digital device. Completely self contained, the PU Series eliminates the alignment hassle found with other devices. Encapsulated sensor head is dust and dirt resistant. Includes 6 feet of highly flexible, UV resistant cable. An excellent ‘Motor Not Running’ feedback device to plc/SCADA systems. We will be wiring the dart PU-20E into our Click PLC. This will provide 10 pulses per revolution. The Dart PU Series pick-up can be wired as a sinking encoder (open collector) or a sourcing encoder. This will allow you to match the existing wiring of your control circuit. We will wire our PU-20E as a sinking encoder input to the Click PLC. 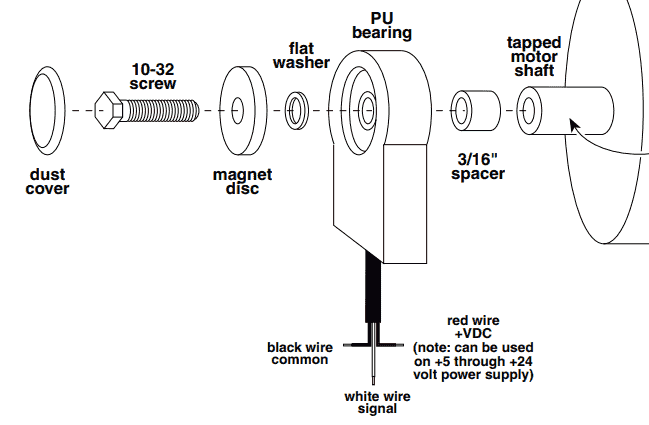 In our example C1 is wired to the +24VDC supply along with the red wire of the PU-20E. The black wire of the PU-20E is connected to the 0VDC and the white (switching) wire is wired to our first input X1. You must have Click Software 2.30 or higher along with the updated firmware of the Ethernet unit with DC inputs to program the high speed counter(s). 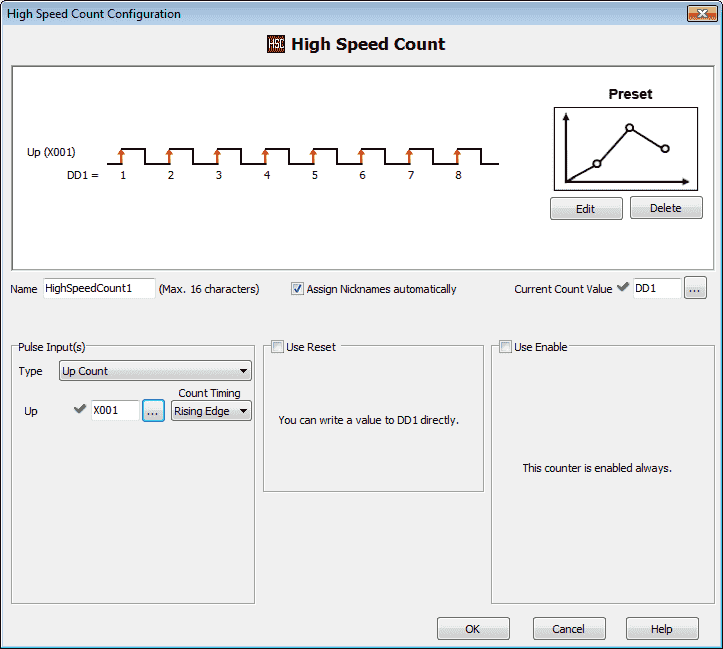 The High Speed Count mode operates independently of the CPU program scan. 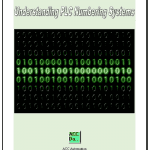 Up to 6 Single-Input Counters or 3 Dual-Input Counters can be configured. 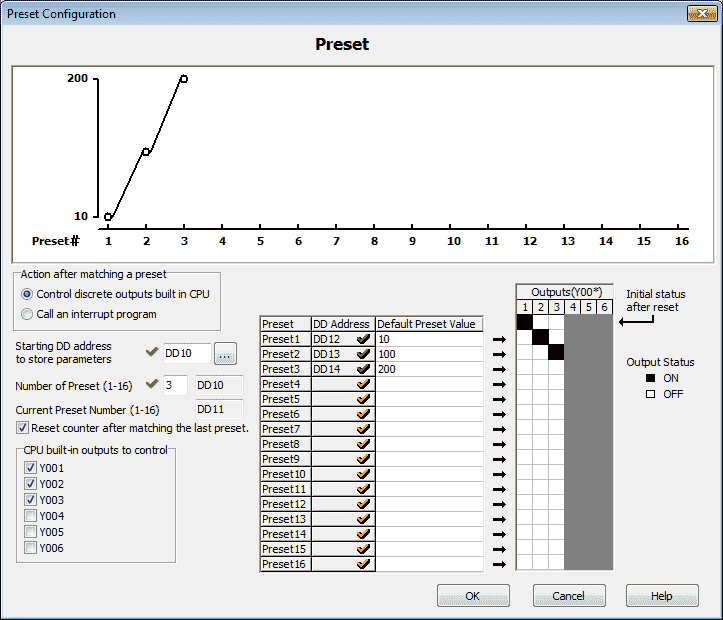 Outputs can be directly controlled based upon the set points programmed. 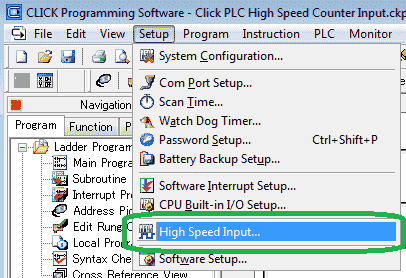 Select the ‘Use This Mode’ under the High Speed Count on the High Speed Input Configuration window. You will now see the High Speed Count mode menu. A timing chart is displayed indicting the way in which this mode will operate based on the current selections. We will be leaving most of these settings as default. Name : This is the default name for the high speed count. HighSpeedCount1. Current Count Value – Set to DD1 – This is the current (PV) present value of the high speed counter. The red checkmark indicates on this screen that the option must be set. Type – Select Up Count. This is where we would select all of the different modes for this mode of counter. Up – Set to X1 Rising Edge. This setting is dependent on the selection of the type. It indicates what physical inputs will be used. Use Reset – Select this if you want to indicate a bit to reset the count. We will leave this off. Use Enable – Select this if you want a bit to enable the counting. We will leave this off. The preset configuration window will now be displayed. Presets enable us to control the CPU built in outputs or call a subroutine program based upon a value that matches the count value. Select ‘Use Preset’. Our preset configuration window will not be displayed. A picture representing the timing chart will be shown based upon the parameters set. 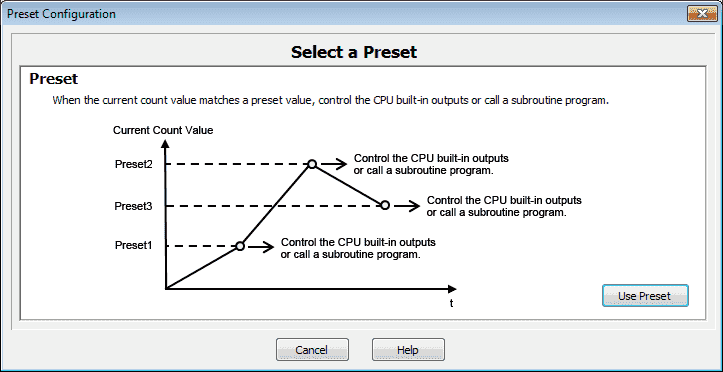 Action after matching a preset – select Control discrete outputs built in CPU. Number of Presets – We will program in 3 preset values. This is the first parameter word DD10 set above. Reset counter after matching the last preset – Select this option so the count will reset automatically for us instead of writing some ladder logic to do this operation. CPU built in outputs to control – We can select the first three outputs on the CPU to control. We can now click on the outputs to indicate when they will be turned on/off in relationship to the preset values set above. In our case Y1 will turn on when the count is reset to the count value of 10. Y2 will be on when the count value is between 10 and 100. Y3 is turned on when the count value is between 100 and 200. Select OK to save and exit the preset configuration window. Watch the video below to see this mode in action. 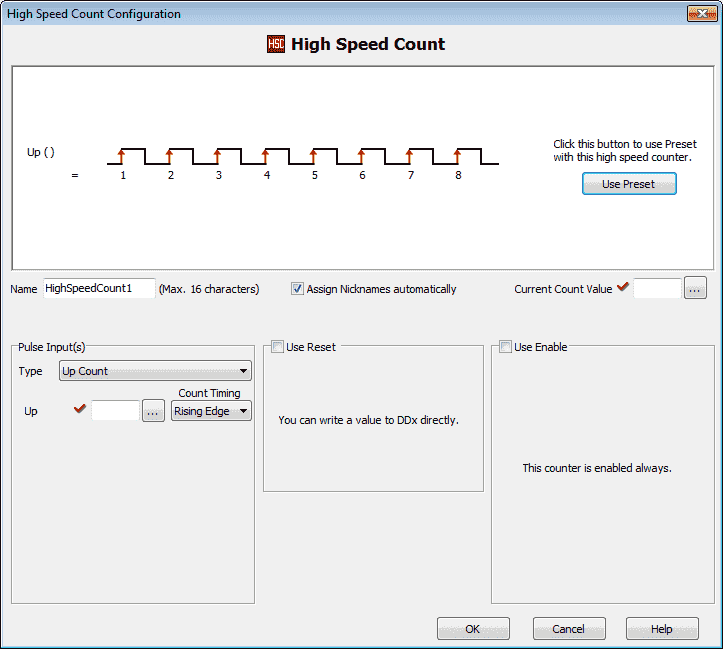 Here is our completed High Speed Input Configuration window. You can quickly see that we have used X1 for out count and the first three outputs for control. The Interval Measurement measures the time between two edges. The two edges can be of a single input, or edges from two different inputs. Select the ‘Use This Mode’ under the Interval Measurement on the High Speed Input Configuration window. 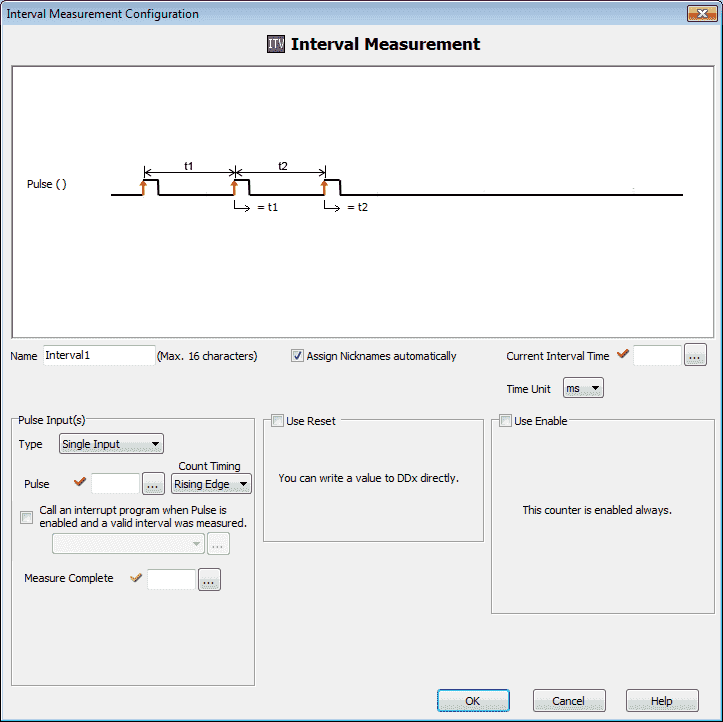 You will now see the interval measurement configuration mode menu. A timing chart is displayed indicting the way in which this mode will operate based on the current selections. We will be leaving most of these settings as default. Name : This is the default name for the high speed count. Interval1. Current Interval Time – Set to DD1 – This is the current time interval measured. The red checkmark indicates on this screen that the option must be set. Time Unit – This is the units that the interval will be measured. Set to us (microseconds). Type – Select Single Input. This can be set for Single or Dual input measurement. Pulse – Set to X1 Rising Edge. This setting is dependent on the selection of the type. It indicates what physical inputs will be used. Use Reset – Select this if you want to indicate a bit to reset the measurement. We will leave this off. Use Enable – Select this if you want a bit to enable the measurement. We will leave this off. Call an Interrupt program when Pulse is enabled and a valid interval was measured – use this option to select the interrupt program to run. We will leave this off. Measure Complete – This bit is Set after each measurement. Rung logic should be used to Reset the bit. We will not set a bit. Watch the video below to see the interval measurement in action. 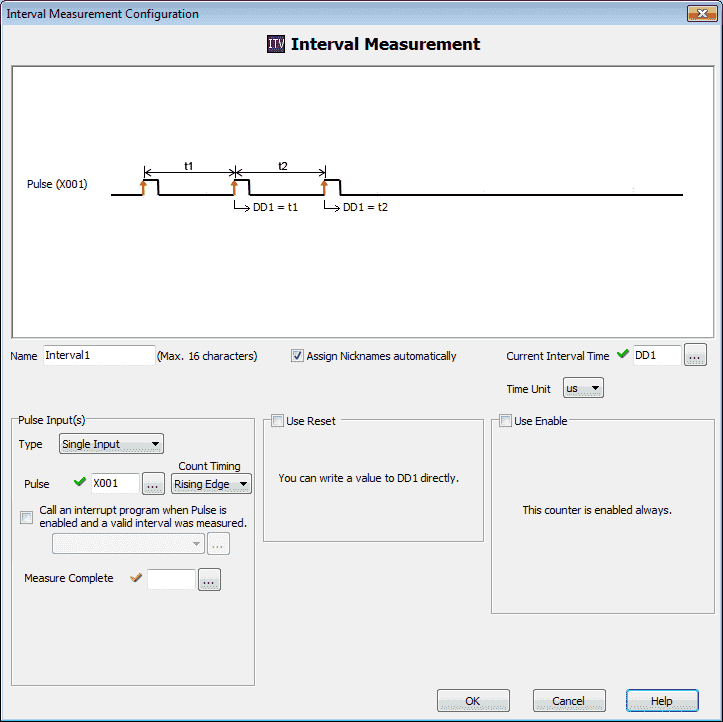 Here is the completed interval measurement configuration window. Select OK to save and return to the High Speed Input Configuration window. You can quickly see that we are using X1 as our input for the Interval Measurement. 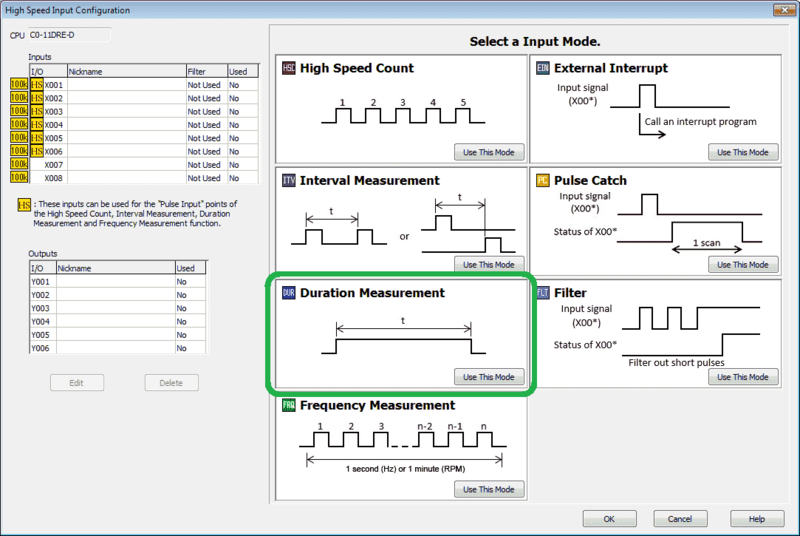 Select the ‘Use This Mode’ under the Duration Measurement on the High Speed Input Configuration window. You will now see the duration measurement configuration mode menu. A timing chart is displayed indicting the way in which this mode will operate based on the current selections. We will be leaving most of these settings as default. Name : This is the default name for the high speed count. Duration1. Current Duration Time – Set to DD1 – This is the current time duration measured. The red checkmark indicates on this screen that the option must be set. Pulse – Set to X1. This indicates what physical input will be used. 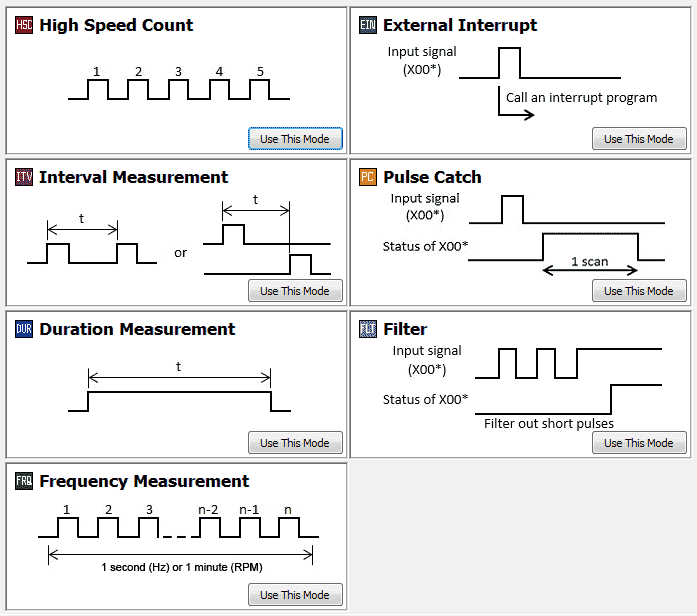 Measured when… – This will determine if you are measuring the input pulse on or off. Leave this as the default ON. Use Reset – Select this if you want to indicate a bit to reset the time measured. We will leave this off. Use Enable – Select this if you want a bit to enable the time measured. We will leave this off. Call an Interrupt program when measurement starts – use this option to select the interrupt program to run. We will leave this off. 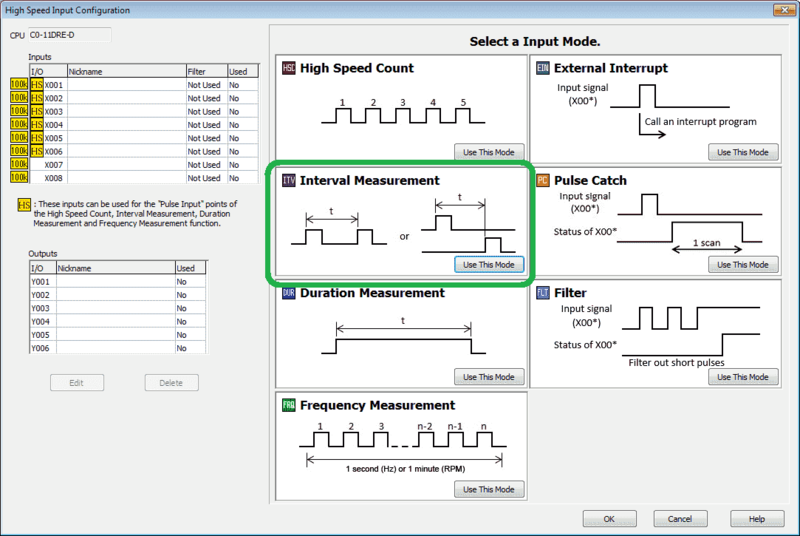 Call an Interrupt program when measurement ends – use this option to select the interrupt program to run. We will leave this off. Watch the video below to see the duration measurement in action. 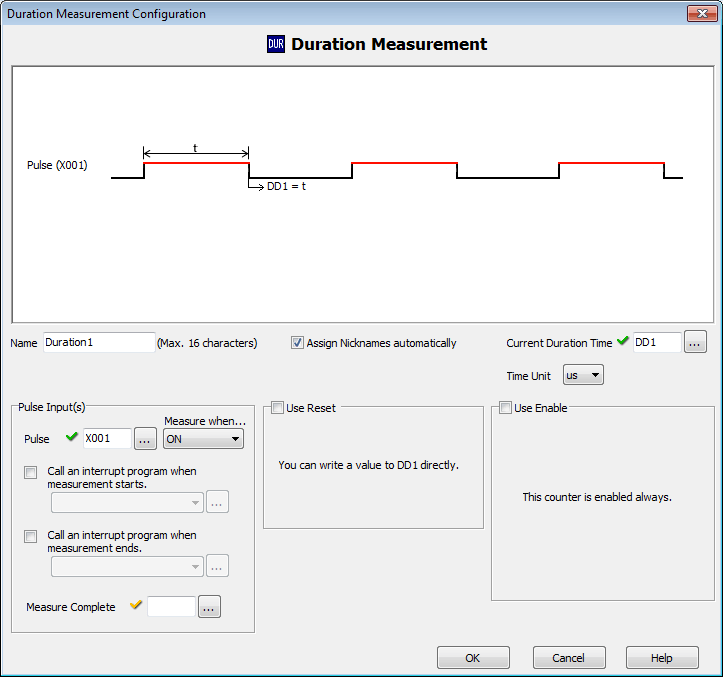 Here is the completed duration measurement configuration window. 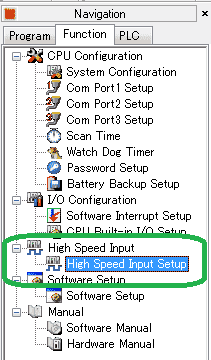 Select OK to save and return to the High Speed Input Configuration window. You can quickly see that we are using X1 as our input for the Duration Measurement. The Frequency Measurement is selectable for either Hz or RPM. Hertz is the number of pulses counted during 1 Second. The actual value provided is a moving average (16 times) by measuring the number of pulses for 100ms. RPM is the number of revolutions during 1 Minute. Select the ‘Use This Mode’ under the Frequency Measurement on the High Speed Input Configuration window. You will now see the frequency measurement configuration mode menu. A timing chart is displayed indicting the way in which this mode will operate based on the current selections. We will be leaving most of these settings as default. Name : This is the default name for the high speed count. Frequency1. Current Frequency – Set to DD1 – This is the current frequency measured. The red checkmark indicates on this screen that the option must be set. Frequency Unit – This will indicate the number of pulses per second. (Hz) You can also select RPM. Revolutions per minute will calculate the number of pulses received every minute. Type – This determines if we have a single input or quadrature. We will leave this as a single input. Count Timing – Rising Edge or Trailing Edge can be configured for the timing. We will leave this as the default rising edge. 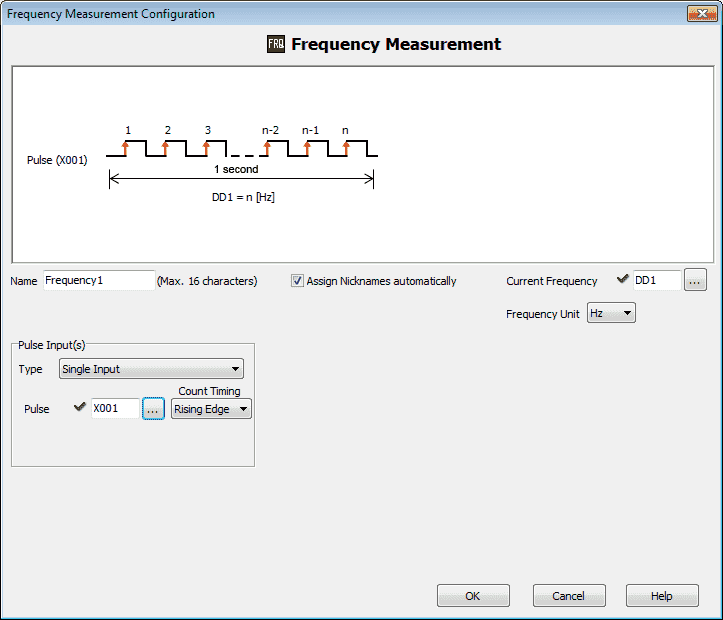 Watch the video below to see the frequency measurement in action. You can quickly see that we are using X1 as our input for the Frequency Measurement. We will add the following line to turn on an output when the frequency measurement is zero. This indicates that the pulses (motor) have stopped. The current frequency (DD1) is compared to 0. If equal then output Y1 is turned on. Next time we will be looking at the External Interrupt, Pulse Catch and Filter Modes of the Click high speed counter. Combining Frequency Measurement and High Speed Count Mode will also be demonstrated.